Ahead of Donald Trump’s event in Mechanicsburg on Monday, Pennsylvania veterans condemned Trump’s offensive remarks and called on Trump to apologize to a Gold Star family he personally attacked multiple times over the weekend. Donald Trump has attacked the US Armed Forces repeatedly: Calling it weak and ineffective, accusing our soldiers of stealing reconstruction money from Iraq, and denouncing prisoners of war for being captured. Folks like me who have served this country honorably for many years are absolutely disgusted at Donald Trump and what he said about those who have sacrificed for this country. It is clear Trump has neither the temperament nor the experience to be Commander-in-Chief and to lead the forces of the United States – especially when we have such complex issues bedeviling the country and the world right now. It is unfathomable that a man like that would want to sacrifice the honor of the military for his ego. Anybody who looks at this objectively will realize that Donald Trump is as hollow as it gets when it comes to being Commander-in-Chief. However, as retired Army Major General Gale Pollock pointed out, our soldiers have all taken an oath to “protect and defend the Constitution of the United States” and are required to refuse illegal orders. We asked Pollock what protocol troops and officers are trained to follow if they are given an illegal order. She responded that you are supposed to raise the issue with the person who gave the order and explain why you believe the order to be illegal. If this does not solve the problem, then the issue must be brought up the chain of command. This is why the question of illegal orders issued by the commander-in-chief is especially problematic. To whom could our military appeal to countermand such illegal orders? This would raise the specter of a constitutional military-civil crisis where our military leaders were forced for the first time in US history to ignore the orders of its civilian leadership. “After 36 years in the Army, I believe very strongly in the values we share in the military. Loyalty duty, respect, selfless-service, honor, integrity, and personal courage,” said I think we have seen a trend of the military being insulted, whether it’s our prisoners of war, men who sacrificed their lives, or veterans. I am just really troubled by this, and I think it’s important we recognize that these behaviors, these accusations are unacceptable for a leader in America. Pennsylvanians respect the men and women who serve. And I would hope that many of us would be offended by the continued insults against our military that Mr. Trump has offered. Last week, Mr. Khizr Khan the father of a Muslim American war hero gave a moving speech at the Democratic National Convention. He also called out Donald Trump’s offensive and divisive religious discrimination that would have prevented their son – an Army captain who gave his life to save other soldiers in his unit – from even entering the United States of America. Fmr. Navy Lt. Commander Manan Trivedi was the battalion surgeon with the first units to cross the Iraq border in 2003. Frankly, I find Donald Trumps latest rhetoric disgusting, disgraceful and reprehensible towards veterans. It’s just one more piece of proof that he lacks any kind of judgement to be our Commander-in-Chief. Unfortunately, I have seen first hand the ultimate sacrifice that people like Captain Khan and so many others have made. For Donald Trump to denigrate his family and service is beyond the pale. For him to attack a mother who is still grieving for her son. It’s shameful. This is not the first time for Trump. Remember his comments about Senator John McCain. Time and time again, Trump has insulted our veterans, and our men and women in uniform deserve better. So, an Islamic terrorist from Pakistan infiltrates the US military, with the intent of getting high-quality training to use in his jihad against Whites, and also perhaps for the purpose of sabotage, and accidentally gets his dumbass killed. I am hereby calling for the Khan family to be immediately deported to Pakistan. What’s more, I want their terrorist son’s body dug up and shipped back with them. This terrorist filth has no more right to rot in our ground than he had to walk on it. Trump’s comments on the Khan family are the latest in a series of his disrespectful rhetoric and record aimed at American veterans and military families such as lying about donations to veterans’ charities, firing employees because of their military service and verbally attacking prisoners of war. Why Did DCCC Endorsement Slip Away From Kevin Strouse? Former Army Ranger Kevin Strouse was named last May as the The Democratic Congressional Campaign Committee (DCCC) “jumpstart candidate” to take on Republican incumbent Mike Fitzpatrick in PA-8. However, this month his name was absent from the DCCC biennial Red to Blue program highlighting the congressional districts they hope to pick up and naming the candidates they have recruited. PA-8 Candidates: Democratic challengers Shaughnessy Naughton and Kevin Strouse and Republican incumbent Mike Fitzpatrick. Strouse’s campaign was dismissive of the importance of being dropped from the DCCC list. They told Philadelphia Jewish Voice that while the DCCC is not openly raising money for their campaign, they still “got a lot of support” in other ways. They suggested that staying on the list was an intricate process, and the campaign had concentrated instead on obtaining the signatures required to get on the ballot. We have heard that the campaign needed to scramble to get sufficient signatures on time, since for most of the nomination period the Strouse campaign had circulated invalid petitions listing the address of Strouse’s future home in the district, which he is purchasing but in which he does not yet reside. Shaughnessy Naughton’s campaign manager, Josh Morrow, lamented Strouse’s unwillingness to engage with voters in the district on the issues. Naughton has offered to debate Strouse, but until recently he has been only willing to meet her at two forums under rules that not only forbid video and audio recordings, but also were closed to the press and to the general voting public. The only people who were permitted to attend were the Democratic Committee members. Naughton’s campaign staff said that she and Strouse have agreed on a debate next month. One of the criteria by which the DCCC judges the viability of a candidate is their ability of fundraising, through their connections and local appeal. The DCCC can help in fundraising, but it does not want to be “carrying all the water” for a candidate. On April 15, all congressional candidates will report their first quarter figures. Perhaps those figures will shed light on why the DCCC has retreated from its support of Strouse. The only way to beat [Fitzpatrick] and put us back on the path to prosperity for the middle class is with a candidate who knows this district as well as he does, who understands the issues that Bucks and Montgomery County residents face, and who presents a real contrast on the issues… Only one candidate in this race has said we should never allow fracking in the Delaware River Basin and only one candidate in this race has articulated a plan to save social security. That candidate is Shaughnessy Naughton. Malvern businessman Michael Parrish was tapped as the DCCC choice in PA-6 last January, after 6-term Republican congressmen Jim Gerlach unexpectedly decided to not seek reelection. But like Strouse, he was left out of the Red to Blue list. An expensive and contentious Democratic primary fight would seriously risk our party’s ability to win this seat in November. I am therefore suspending my campaign in order to join with Manan Trivedi to help ensure that a Democrat is elected. All of the other previous endorsed candidates remained on the DCCC list and they were joined by new endorsements. DCCC Chairman Steve Israel (Congressman NY-3) emphasized that for the first time in committee history, women make up more than 60% of the list. Locally, however, with Allyson Schwartz leaving Congress to run for Governor, Pennsylvania may have an all-male congressional delegation for the first time since 2001. Since 2006, Temple Beth Hillel-Beth El’s Men’s Club, Sisterhood and Israel Action Committee have jointly organized candidate forums to provide the community an opportunity to discuss issues with our Congressman and his challenger during each Congressional election. Until the recent redistricting, our township Lower Merion was located in Rep. Jim Gerlach’s 6th district. The 6th District was one of the most competitive districts in the country. While the Republican incumbent was always reelected it was usually by small margins and the district was carried by the Democratic Presidential candidate. Since the redistricting, Gerlach has replaced Democratic leaning Lower Merion with Republican leaning parts of Berks county in order to give himself some breathing room. Lower Merion is now part of the heavily Democratic 2nd Congressional District. The 2nd District is represented by Chaka Fattah who has been elected and reelected by enormous margins. The lopsided demographics in this district lead to insurmoutable odds which discourage any serious challengers. In fact, the Republicans did not even bother fielding a candidate in 2000. (Ken Krawchuk was the Libertarian party’s candidate.) I have long argued that redistricting should be nonpartisan and have the goals of eliminating such non-competitive districts and creating a state map that reflects the partisan balance of the state. The country is best served when both parties field the best candidates they have to offer and provide the voters with a real choice. This year Rep. Fattah is facing a pair of political neophytes: the Republican Robert Mansfield and Independent candidate Jim Foster. According to the Federal Election Commission, Fattah has raised over a half-million dollars while Mansfield has raised about ten thousand, and Foster has not reported any campaign contributions. A fair crowd was on hand to get acquainted with our new Congressman. However, due to a couple of simultaneous events at the synagogue and the lack of a competitive contest the attendance fell short of the previous candidate forums organized at the synagogue. Rep. Fattah spoke first and a sizable fraction of audience excused themselves after his remarks. Rep. Fattah described the annexation of Lower Merion by his district as “a shotgun wedding arranged by the Pennsylvania Republicans” but he was happy to meet his new constitents. His first political campaign was to represent the Overbrook neighborhood (in Philadelphia about one mile from our synagogue) in the Pennsylvania General Assembly. He won that 1982 primary by a mere 58 votes out of over 10,000 votes cast, so he is well aware of the value of every vote. AIPAC has described Chaka Fattah as one of the most reliable and stalwart pro-Israel members of Congress. His chief of staff has just returned from a mission to Israel, and the Congressmen will soon embarking on his first trip to Israel. As the ranking member of the Appropriation Committee’s Science Subcommittee, he will be leading a delegation from the National Science Foundation to launch new collaborations between the US and Israel in the field of Neuroscience. Fattah has spearheaded this funding which is destined to improve our understanding of age-related degenerative diseases of the brain and traumatic brain injuries. The leadership of the local Hadassah chapter was on hand and encouraged the Congressman to visit Hadassah Hospital which is a pioneer in medical research and an example of how Arab and Jewish doctors can cooperate to improve the health of patients of all races, religions and nationalities. Chaka Fattah is married to NBC10 anchorwoman Renee Chenault-Fattah and has four children. He is now running for his 10th term in Congress and emphasized the value to the district of having a senior member of Congress on the Appropriations Committee. The Congressman was happy to get acquainted with his new constituents and promised to return after the election and continue the conversation at greater length. The Republican challenger Robert Mansfield is a combat veteran having served thirteen years in the US Army and National Guard. His service was ended by trauma from an I.E.D. explosion. In a spirit of true bipartisanship he thanked Rep. Fattah for his dedication to funding research on traumatic brain injuries. At birth he had to overcome a dependance on heroin he had acquired from his mother who used drugs during her pregnancy. He endured a tumultuous childhood in foster care. And he suffered from the homelessness all too common to our returning veterans. As a fervent member of the Episcopal Church, he expressed dismay at Christian groups boycotting Israel. For Sgt. Mansfield support for Israel is founded in the teachings of the Bible. He fears that Obama is not taking the Iranian nuclear threat seriously and that Obama has agreed to negotiations with Iran. He says Iran is “four years closer” to making a bomb. He says that the US has sat idly by with ineffective sanctions. He recommended imposing “real sanctions like we had against South Africa”. While Iran was said to be “months” away from a bomb when Obama took office, his administration is clearly responsible for the CIA working hand-in-hand with the Israeli Mossad to sabotage Iranian centrifuges, missiles and most recently computers. Meanwhile, Iranian physicists are dying in the streets of Tehran and this is not from the common cold. I concluded by asking specifically what additional steps would Mansfield recommend if he was in Congress? If he were Congressman or President, would he recommend an immediate tactical nuclear strike on the underground bunkers where the Iranian enrichment facilities are hidden? He repeated the discredited meme about Obama’s “apology tour”. He warned that the bridge from Yemen to Somalia “to be completed by 2020” would strengthen al Qaeda. While such a bridge (The Bridge of Horns) was proposed, it is not under construction and has not been funded. The fanciful bridge would be 18 miles long and in order to avoid disrupting navigation it would have the longest suspension span in the world (3 miles long). The Saudi and Yemen government oppose the African refugees that such a bridge might bring to the region. Moreover, Yemen and Somalia are two of the poorest countries in the world, so a bridge connecting them would not be “a bridge to nowhere” but rather “a bridge from nowhere to nowhere”. Jim Foster is running as an independent although he had to win a lawsuit against the Pennsylvania Election Commission in order to do so. He has published the Germantown Chronicle since 2009. He would then steer back to local Philadelphia politics. I almost got the impression that Foster was running for Mayor Nutter’s job, not Representative Fattah’s job. Former Congresswoman Marjorie Margolies hosted a fundraiser for Democratic Congressional candidate Dr. Manan Trivedi, with Kate Michelman, former president of NARAL, as the keynote speaker. Michelman recounted her own personal story of trauma and humiliation back in the late 1960s, before Roe v Wade, when she had to appear before a board of male gynecologists and then receive a letter of permission from her estranged husband in order to receive a therapeutic abortion. Even though Trivedi’s district no longer includes Lower Merion, he is still a favorite of Democratic supporters there. Photo by Bonnie Squires: Dr. Manan Trivedi, talks to Dayle Steinberg, head of PA NARAL; host Marjorie Margolies; and Kate Michelman at a reception in his honor. The 22nd annual Stu Bykofsky Candidates’ Comedy Night, a benefit for Variety, the children’s charity, was held this evening at Finnegan’s Wake. Since this is primarily a political blog I didn’t take notes on the speakers who aren’t running for office. As always, this is not intended to be an exact transcript, just rough notes I took at the event. It would be impossible to capture every joke, especially the longer, more involved story jokes, but I made an effort to provide some idea of each candidate’s routine. Text implies a direct joke, notes in brackets are condensations or gists. Actions or extraneous activities are in italics, as are candidates’ names. Read your local newspapers for more exact accounts of the event. Running against incumbent Sen. Bob Casey (D). I am new to politics and most people in Philadelphia aren’t familiar with me. My father died when I was 20 and I had to look after the family so I couldn’t go to college but I sent my daughters. [shows a slide of what he would have looked like if he had gone – his face superimposed on someone wearing a college tshirt holding a beer mug]. My wife is with me, as you can see I let her get a new dress for the event [American Gothic painting with Mr. and Mrs. Smith’s photos in it]. I worked in a coal mine [Smith’s face on the front of Thomas the Tank Engine, pulling a load of coal]. I had big dreams [his face added to a picture of the Beverly Hillbillies]. My wife and I adopted four children so a family could stay together. People say I am a Tea Party candidate but there are a lot of things about me you don’t know [his face added to an Occupy Pittsburgh group photo]. Incumbents do comedy every day, make fools of ourselves every day. This is for the kids. Rep. Allyson Schwartz (D), PA 13th Congressional District, sent a surrogate, Neil Deegan. Needed a haircut for the DNC. I went to high school in South Philly. Pat Meehan went to the Chestnut Academy. Chris Christie is in the hospital. He has that flesh eating bacteria. He only has 13 years to live. Fidel Castro’s successor will be his idiot son, Fidel W. Castro. Running against Kathleen Kane (D). Thanks to Kathleen Kane for picking up the tab. I went to college with Cecily Tynan. Fan of Philly sports teams [joke about the 1996 Phillies being bad team]. People say I am too close to Gov. Corbett – he wrote my jokes. [fakes a phone call from Corbett]. Yes, Risa Vetri Ferman’s here — she’s sitting right next to me. No, she still won’t run for Attorney General. Running against incumbent Rep. Mike Fitzpatrick (R). I want to show that I can be funny on purpose and not just by accident. I wanted to find a job more popular than being in Congress but the TSA didn’t have any opening and Elliott Spitzer already has a co-host. Running against incumbent Rep. Bob Brady (D). [John Featherman was very funny with jokes about being Jewish and his “mixed marriage” to an Asian woman]. Two Chinese people had a white baby but everyone knows two Wongs don’t make a white. A union friend wanted to find a whorehouse where the prostitutes got to keep more of the money than the madam. They finally found one and the union friend asked for a pretty young blonde but the proprietor said he had to take 62 year old Ethel, because of seniority rules. Intermission with comedian Joe Conklin who told some good jokes and did impressions of political figures. He also gave a shout out to the girls from Club Risque and said they were the only ones there with bigger [breasts] than Bob Brady. Stu thought the Variety Club was a dating service. My opponent George Badey is a mummer. He wants to go to Washington, wear satin pants, a feather boa and lipstick. J. Edgar Hoover already did that. Anthony Wiener got in trouble for sexting. He was trying to decide whether or not to resign. He was in, he was out, he was in, he was out, now he’s holding his own. Bill Clinton oversaw Wiener’s wedding. When the scandal broke he called Clinton to apologize — for what, copyright infringement? There is an auction for a restaurant gift card which Emerald Capital bids more than the card is worth, then ups that bid when Stu includes a gift basket. Running against incumbent Rep. Jim Gerlach (R). My wife is from a very traditional family. When they heard I wouldn’t be a full-time doctor while I am running for office they asked for three chickens back. Jim Gerlach and Paul Ryan work out together — they practice their Atlas Shrugged poses. Unlike Todd Akin, I know when my time is up. Congressman Jim Gerlach, Republican, 6th Congressional District, sent surrogate Kori Walter, district director. Mitt Romney bet me $10,000 that I wouldn’t do this. Running against incumbent Rep. Chaka Fattah (D) and Robert Allen Mansfield, Jr. (R). Robert Mansfield, Republican candidate for 2nd Congressional District, sends surrogate Ned Green. Running against incumbent Rep. Chaka Fattah (D) and Jim Foster. [says he met Mansfield in the 1990’s on another political campaign, Mansfield was homeless then]. Says Mansfield isn’t there because he has a lot of injuries from being in Iraq and is seeing a brain specialist today. Smith, Casey, Schwartz/Deegan, Kane, Trivedi, and Boockvar did well. I was surprised by the Republican candidates telling Romney/Paul jokes. That seems unusual. It was nice to see two women on the stage. Maybe one of these years Congresswoman Schwartz will join us in person? Kathleen Kane’s routine had a homespun, Lake Woebegone feel to it. Boockvar was a little edgier. The girls from Club Risque paraded from one side of the room to the other about three times, which is the standard from the other years I’ve attended, but this year they were wearing clunky shoes and the sound was disruptive. Cross-posted from Above Average Jane. Photo Credit: Bonnie Squires. 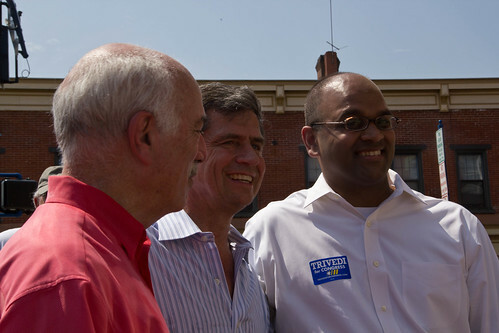 Former Congressman Joe Sestak, who bested Arlen Specter for the Democratic Senate nomination in 2010, was also on-hand to endorse Trivedi, and to build enthusiasm for Trivedi’s campaign. Sestak, who rose to the rank of admiral in his own naval service, spoke to Trivedi’s teamwork and sacrifice, voicing his support for President Obama and the entire Pennsylvania Democratic ticket. Democracy for America (DFA) is a grassroots powerhouse working to change our country and the Democratic Party from the bottom-up. We provide campaign training, organizing resources, and media exposure so our members have the power to support progressive issues and candidates. The national organization’s website invites citizens across the nation to join a true grassroots movement, unbought and truly independent. Montgomery County Democracy for America meets monthly at the Jenkintown Public Library, 460 Old York Road, Jenkintown, PA, on the first Thursday of each month. The only thing that can compare to the ongoing assault on fairness by Republicans in Washington is what Republicans in Harrisburg did with the Pennsylvania redistricting process. Partisan politics won out in the end. Even my home county of Berks with a population of just over 400,00 got split into four congressional districts. Republican politicians are breaking the public’s trust by breaking apart our community. Regardless of where the overreach in protecting political power originates, I am not deterred. As I continue to run for Congress in Pennsylvania’s 6th congressional district, I will fight to bring about the common sense values that my friends and neighbors deserve. I am especially looking forward to speaking with the new voters of the district, including in the town of Fleetwood where I grew up and went to school. I’m eager to compare my career of serving our nation to that of career politician Jim Gerlach who falls in lock-step with Republicans in Washington who have just voted to raise taxes on the middle class and support the elimination of Medicare as we know it. 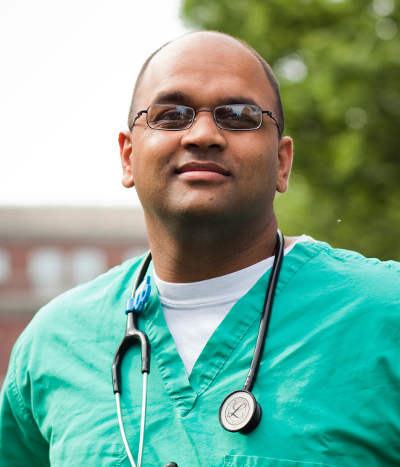 Dr. Manan Trivedi is a primary care physician who served as a battalion surgeon with the Marines during the Iraq War. He and his wife Surekha and their 20 month old daughter, Sonia, live in Berks County. While Pennsylvania limps along with the redistricting process, it looks like the same names who ran in PA-6 last year will likely do it again next year. In 2010, there was a bitter Democratic primary between Doug Pike and Manan Trivedi. Manan won by 714 votes, and went on to lost to Jim Gerlach by 14 points. Manan has already started raising money (he sent a letter), and Doug is leaning towards running (I asked him). Can both of them run against Jim? Maybe. The 6th district was created in 2001 FOR Jim Gerlach. Back in March, I posted on the current map, the census data, and the likelihood that the sole PA district that wouldn't change is Bob Brady's district, as no one messes with Bob Brady. You'd think the state would have made some progress since then, but this is Pennsylvania. The redistricting committee is always made up of two Democrats, two Republicans, and a chair selected by the four. As usual, they couldn't agree, so it went to court. The committee, with its court-appointed chair, is supposed to come up with a plan by 11 August. As of this writing, the most likely outcome is that Mark Critz's district (Murtha's old district) will be the one to go away. From a census perspective, it's the most reasonable. This redraw will pit Jason Altmire (CD 4) and Mark Critz (CD 12) in a primary. The GOP committee (and it is) will try hard to also force Allyson Schwartz (CD 13) and Chaka Fattah (CD 2) into a primary. However, it's likely that Tim Holden's area (CD 17) will grow to include Scranton, and become a more safe Democratic seat. This in turn will shore up the Republican pockets Lou Barletta (CD 11) needs. Meanwhile, the GOP wants badly to increase their holds of the 6th and 7th. The 7th was Joe Sestak's, but is now Pat Meehan's. I haven't heard that Joe is thinking of running again. The eastern parts of these districts would have to move to force the Schwartz-Fattah primary. If the 6th moves north, and the 7th moves west, Manan would be in the 6th (he lives in Birdsboro). Jim would be in the 6th (West Pikeland), but Doug may well be in the 6th, as he lives in Tredyffrin (which was part of the 7th until 2001). So a primary re-match is a maybe, but Jim will certainly be challenged. If you're having trouble with what's where, click on the map to see a larger version. It's hard, I know, as some of the numbers are across the state from one another. We'll have to wait a while to find out where Manan and Doug will run, and it would be great if they could run without having to re-fight that primary, which was ugly. Both are solid candidates, and without having to spend time, money and resources on a primary would have a good shot against both Jim and Pat. There is a lot of animosity against both of the incumbents from long term Republicans who feel that they, especially Jim since he's been there longer, have abandoned Republican ideals for their sell-out to the teabaggers. Thus, Democrats running on what will likely be a bring back Social Security, Medicare and Medicaid platform will perform well. Remember, demographics in this area skew old. I'll be back with a more detailed look after the districts are drawn next month. Every election year since 2006, Temple Beth Hillel Beth El’s Israel Advocacy Committee, Men’s Club and Sisterhood invite the Congressional Candidates for Pennsylvania’s 6th district to speak to the community, and this year was no exception. Incumbant Republican Congressman Jim Gerlach was followed by his Democratic challenger Dr. Manan Trivedi as they both addressed the crowd and took questions on a wide range of issues. As was the case in the first debate between Gerlach and Trivedi, there was a small incident before the beginning of the event as the Gerlach campaign asked that the event not be filmed, and all recording equipment was removed. The second debate was televised and can be seen on the PCN website. This forum was not a debate format as the candidates appeared sequentially. Both candidates were pessimistic about the current peace negotiations. Gerlach said he “saw no signs of a breakthrough there”. Trivedi blamed the Palestinian leadership “We need someone who can come to the negotiating table without preconditions.” Gerlach cited “Gaza’s extreme poverty and lack of educational opportunities which fosters hatred of Israel.” He added that the neighboring Arab countries could do something about the situation in Gaza but they are not interested. Trivedi spoke of his Indian heritage which gives him reason to be vigilant yet optimistic. His family and friends who were affected by the terrorist attack last year in Mumbai remind him of the danger posed by terrorist groups like al Qaeda and Hamas who Trivedi insisted we “cannot negotiate with”. Yet he also recalled lessons from his parents’ hometown in India. Ahmedabad was a city plagued by rioting between its Hindi and Muslim communities following the independence and partition of India in 1947, but the Indian government seeded economic development, and once everyone was more secure financially, suddenly they were less concerned with religious differences with their neighbors. The former Soviet Leader Mikhail Gorbachev recently warned that winning a war in Afghanistan is impossible. Gerlach was asked how he would vote on withdrawing troops from Afghanistan. Gerlach said “I would have to vote ‘no’ because I want to hear from General [David] Petraeus” who is reviewing the United States’ strategy in the region. Gerlach doubted whether Hamid Karzai’s government could stand long without our support. Both candidates tried to distance themselves from the leadership of their parties. Manan Trivedi said he did not support Obama’s support of Human Rights initiatives in Israel, applying the Nuclear Non-proliferation ban to Israel or Biden’s insistence of a housing freeze in Jerusalem. Trivedi criticized the implementation of the stimulus bill, disagreed with the surge in Afghanistan and felt that the health reform bill did not address costs. I will take a good idea whether it comes from a tea party supporter or a left-winger or anything in between. We need a new breed of leaders who have no political chips to cash in. Matt Hirsch asked Gerlach if there were any issues on which he disagreed with Republican House Minority Leader John Boehner. He cited several votes where he opposed the Bush administration: Overriding Bush’s veto of S-CHIP and supporting stem cell research. In fact, during Gerlach’s first three terms he built a moderate record by voting strategically: voting with his party when his vote was needed and voting with his moderate district when it was not. In this Congress, the Republicans have insisted of party discipline in order to avoid giving a hint of bipartisanship to legislation passed by the Democrats. Accordingly, the Philadelphia Jewish Voice followed up and asked for a more recent example where Gerlach opposed his leadership in the last two years. Gerlach said he supported his leadership on all of the major pieces of legislation: namely in opposing the stimulus package, health-insurance reform and cap-and-trade energy policy. Indeed Gerlach has been much more consistent lately in voting with his leadership though he did vote last July to extend unemployment benefits opposed by the Republican leadership. Gerlach was also asked to comment on the impact of the tea party movement. Gerlach cited several local tea party groups who he said were “very engaged”. He praised them for “stepping up as citizens” and said “this is a good thing”. Neither candidate eluded to alleged excesses in the tea party such as racism, rejection of principals such as civil rights or the Separation of Church and State, violence against Lauren Valle in Tennessee and the “citizens arrest” of a reporter in Alaska. The 2001 and 2003 Bush taxes cuts expire at the end of this year. Unless Congress takes action during the lame-duck session or takes retroactive action next year, tax rates will revert to the levels they were at during the Reagan and Clinton administrations. For the richest Americans this would raise their marginal tax rate from 35.0% to 39.6%. Jim Gerlach said that he along with the entire Republican caucus and “about 50 moderate Democrats” in the House of Representatives favor making the Bush tax cuts permanent. He doubted whether Pelosi would have the political strength to address this issue during the lame-duck session following the upcoming mid-term election. Gerlach also wanted to address the Alternative Minimum Tax which was never indexed and is catching more and more middle-class Americans. The Federal Budget for the new fiscal year has not yet been passed so the government is acting under a Continuing Resolution until December 3. Gerlach doubted the new budget would be passed in the lame-duck session but was confident that another Continuing Resolution would be passed to avoid a government shutdown before the new Congress could act on the budget in January. Gerlach said “the current deficit spending is 20% of gross domestic production whereas historical it has been around 18 to 19%.” In reality, the deficit was 9.91% at the end of last year and it will grow to 10.64% based on the proposed budget which is less than the figure Jim Gerlach cited but still well above deficits seen since the end of World War II. To solve this problem, Gerlach intends to draw on his experience as a State legislator where the budget had to be balanced. “Only the Federal government does not have a balanced budget requirement”. Calling the current situation “unsustainable”, Gerlach called for a Balanced Budget Amendment to the United States Constitution with exception in times of war or other national emergency similar to that proposed in during the Lyndon B. Johnson Administration. Similar amendments failed to pass the House by the required two-thirds majority in 1982, 1997 and 2005. Once the amendment passes Congress, it would then have to be ratified by 38 states before going into effect. Gerlach was asked specifically what he would cut in order to balance the budget since entitlements, the military and interest make up 84% of the budget. Gerlach said that all areas of spending have to be under consideration including Medicare and Social Security. Gerlach also pledged to look at defense spending as well. From Trivedi’s experience in the military, he agrees with Secretary of Defense Robert Gates that we need to be more efficient and eliminate unneeded weapon systems. In Iraq, Trivedi saw contractors paid five times more to do half of the work of an enlisted serviceman. Trivedi called Washington DC an “evidence-free zone” suggesting that by observation we can fund best-practices and drive costs down for a wide range of government programs. Trivedi emphasized stimulating sectors of the economy which have a ripple effect and will provide long-term benefits for the economy. One example was the clean energy economy. Trivedi said we should work on smart grid, wind turbine and solar power technologies. “We are not doing the things the Chinese are doing, and they are going to be the leaders” in green technology and not us if we do not step up to the plate. Similarly, Trivedi wants to invest in infrastructure such as tunnels, roads and light rail here in the Sixth Congressional District and around the country in order to provide jobs right now and continue to create jobs in the future. Gerlach was asked if he would defund the Health-Insurance Reform which he voted against. He said he favored repealing the bill and replacing it with a new one without the “onerous new taxes.” (Gerlach did not explain how he would overcome the anticipated Presidential veto in order to repeal the bill.) Gerlach emphasized buying insurance across state-lines and working on tort reform as a way to drive down costs. He would also work to slow down and delay implementation of certain provision of the Health-Insurance Reform Bill. He did not expect an immediate solution, and expects this to remain an issue for next several administrations. Trivedi looked at ease on the subject of Health Care and spoke with expertise not only as a battalion surgeon and as a primary care physician, but also as an expert on Health Policy. He received a Masters degree from UCLA in Health Policy and went on to serve as health policy advisor to the Navy Surgeon General and was an Assistant Professor of Medicine at the Uniformed Services University of Health Sciences. Gerlach’s handout claimed Trivedi supported a “socialized single-payer medicine scheme.” However, Trivedi denied the allegation. Trivedi said the Health-Insurance Reform bill was not perfect: it did not address costs and it was too long, but he would have voted for it because it was a step in the right direction. He compared it to other pieces of landmark legislation (such as civil rights legislation which still left many people unable to vote). These bills aspire to historic change but need to be improved over time. Trivedi rejected repealing the bill as a step in the wrong direction. Trivedi gave one of his own patients as an example who was unable to obtain coverage even though she was cancer-free because her medical files mentioned the word “cancer”. Temple Beth Hillel-Beth El’s Rabbi Neil Cooper asked Manan Trivedi about coverage for mental health. Trivedi answered that “mental health is part and parcel of health care.” He lamented that mental health care has been unfairly stigmatized for generations and as a result post-traumatic stress disorder (PTSD) had not been treated as pro-actively as it should. During his work with the Navy’s Surgeon General, Trivedi drew on his own experience with combat medicine to become one of the early researchers to investigate the unique mental health issues affecting our troops returning from Iraq and Afghanistan. Israel Action Committee chairman Lee Bender concluded the event by urging everyone to get out and vote next Tuesday.